THE EVENT IS RESCHEDULED! A NEW DATE WILL BE ANNOUNCED SOON! An Evening of Romantic Ghazals & Bollywood Songs!! Most anticipated event on the Adelaide social calendar this year!! When – THE EVENT IS RESCHEDULED! A NEW DATE WILL BE ANNOUNCED SOON! Saanjh, in collaboration with Aussiez Migration, invites you to a fragrant evening of romantic and heartwarming ghazals presented by renowned ghazal singer Sudeep Banerjee. 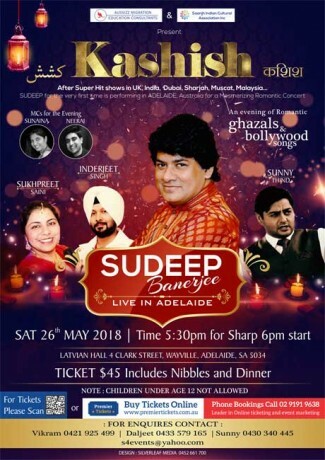 Featuring some of the popular ghazals from private and movie albums, this evening will also showcase Adelaide singing talent Sunny Thind,Sunaina,Sukhpreet, and Inderjeet. Popular MCs Sunaina and Neeraj will host the evening. Woh ghazalein jo tab sunte the, wohi aaj bhi sunte hain… Waqt badla hai lekin unka lutf aaj bhi vaisa hi hai… Like old wine, these ghazals have matured in our memories. Who can forget Jagjit ji’s “Hothon se choo lo tum…” or Ghulam Ali sahib’s “Chupke chupke raat din…”, magnificent Rafi’s “Hum bekhudi mein tum ko pukare chale gaye” or Bhupendra’s “Dil dhoondhta hai…” Every time we listen to these and many such immemorable ghazals, we get to relive many precious and beautiful memories! Come and rekindle those memories and enjoy an evening full of warmth and rememberances. Enjoy the music and the lovely ambience made more attractive with sumptuous nibbles and food. Come and be a part of this wonderful feeling called Kashish! Do not miss out on the most anticipated event on the Adelaide social calendar. Get your ticket early!! We look forward to a fun and entertaining evening !! Adults & children aged 12 yrs and over will be charged full ticket price. 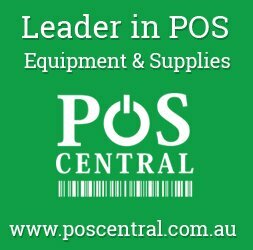 Premier Tickets Australia is proud to be the online ticketing partner for KASHISH @ Latvian Hall Contact us for any of your ticketing & marketing needs.